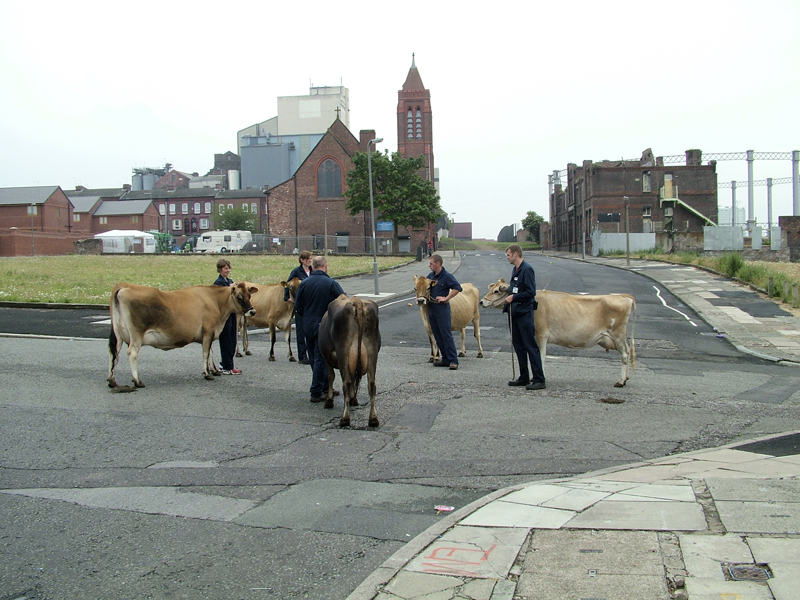 On the 18th July 2005, in the early hours of the morning, 5 cows, 5 calves, 3 stockmen and a milking parlour arrived in Toxteth. They remained for 9 days and cows grazed in various vacant sites in Toxteth. 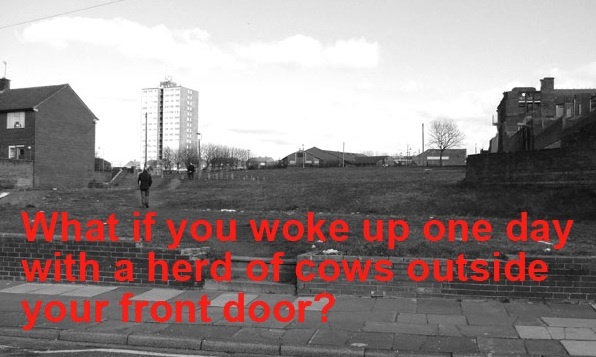 The COW the udder way project focused on Liverpool and effects of ‘shrinkage’ on the inner city areas of Toxteth. Through engagement with the public, the performance/event created a platform for debate on how derelict or neglected land could be used in the future, and suggested urban agriculture as one way of appropriating these spaces. The event recieved great interest from the local press, radio and television. Documentation from the event has also been exhibited globally as part of the Shrinking Cities Exhibition tour. ‘In January 2004 the Shrinking Cities Project, a project initiated by the Kulturstiftung des Bundes (German Federal Cultural Foundation), together with the magazine archplus organized the international ideas competition Shrinking Cities – Reinventing Urbanism. The competition’s goal is to find new modes of action; new ideas of the city based on the specific peculiarities of shrinkage, and those, which follow an interdisciplinary approach. Teams from around the world were encouraged to develop projects with the theme of shrinkage for one of the four locations under investigation (Halle/Leipzig, Manchester/Liverpool, Detroit and Ivanovo). The current international process concerning the shrinkage of cities radically challenges the subject matter of the traditional disciplines of spatial design, architecture and urban planning. Dynamics and growth were the formative dimensions characterizing the urban modernisation and a relatively balanced spatial development in the 20th century. The current spatial polarisation between islands of growth and places of decline, which leads to the dereliction of whole cities and regions, does not discharge the space-oriented disciplines from their responsibility to design. Symbolic strategies of revaluation via iconic architecture as well as the artifcial urban hype via consumerism and entertainment are exhausted. The competition Shrinking Cities – Reinventing Urbanism does not only ask for the scope of designing shrinkage but also challenges the traditional tools of the space-oriented disciplines. Given the radical structural changes of urbanity spaces can no longer be functionally, socially, let alone aesthetically pre-programmed. Team: Paul Cotter (film-maker), Gareth Morris (architect/what if:projects), Heidi Rustgaard (choreographer/H2DANCE), Eike Sindlinger (architect), Ulrike Steven (architect/what if:projects), Susanne Thomas (choreographer/seven sisters group). Participants: Mark Davis, Neil Pinguenet, Mark Saunders from Westcott Farm Devon. USA, New York: Pratt Manhattan Gallery / Van Alen Institute, December 8th 2006 – February 21st 2007. USA, Cleveland: SPACES Gallery und Cleveland Urban Design Center, April 20th – June 8th 2007. Britain, Manchester: CUBE / Liverpool: RENEW Rooms, November 16, 2007 to January 26, 2008. The Graham Foundation for Advanced Studies in the Fine Arts, Chicago.15th of October 2009 – 15th March, 2010.